The decade of the 1830s was shaped by Andrew Jackson’s stormy presidency. The former frontier general and hero of the War of 1812 enjoyed a special place in the public’s heart in an era when military heroes were national celebrities, not unlike movie or sports stars of today. Jackson viewed himself as the champion of ordinary people and democracy, but he governed with an iron will and presided over radical changes in the way government worked. His wild and woolly monetary policies, curbing the extensive use of paper money, surely helped to bring on the banking Panic of 1837. Under his administration however, the United States grew from adolescence to adulthood, setting a course that by 1849 expanded the country’s borders to the Pacific Ocean. By the end of the “Jacksonian Era” in 1837, the United States was ready for a change in coinage design that reflected its new power and prestige. One of Jackson’s appointees was Mint Director Robert Maskell Patterson. Patterson’s idea for a new design reflected the country’s imperial mood. He had long admired the image of Britannia found on British copper coins, and he directed Chief Engraver William Kneass to sketch the figure of Liberty using a similar motif. Kneass prepared a rough sketch but suffered a stroke shortly thereafter, so further sketches were done by artists Thomas Sully and Titian Peale. With Kneass ill, Patterson offered part-time Mint employee Christian Gobrecht a permanent position as Second Engraver and ordered Gobrecht to prepare dies based on Sully’s drawing. 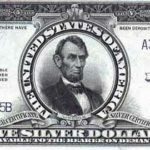 The resulting design, which first appeared on the silver dollars of 1836, was hailed for more than the exquisite art that it was. To many, it symbolized the empire building the United States was embarking upon; an imitation of the “mother land,” but tempered with democratic ideals. The design depicts Liberty seated on a rock holding the Union Shield. The shield bears a scroll with her name. The design unmistakably borrows from the English motif, except for the substitution of the Liberty cap for the trident. 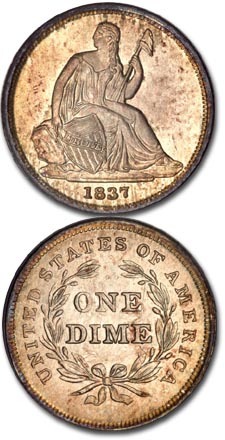 As executed on the new 1837 dime (and half dime, as well), the seated Liberty figure rests on clear, uncluttered fields. The reverse shows the words ONE DIME within a wreath, encircled by UNITED STATES OF AMERICA. This is the first time that the word “dime” appears on a U.S. coin. The Capped Bust design that preceded the Seated Liberty used the designation “10C.” The obverse design’s high-points for wear are the knee, breast and head area. On the reverse, check the bow knot and the edges of the leaves. From its early days, the Mint’s goal was to create a method for creating a consistent coinage that would deter counterfeiting and assure quality control. On the small scale of the dime and half-dime, the obverse design, sans the 13 stars, only needed the date punched into the working die. This was accomplished in one blow with a punch containing all four digits. The reverse design was a technological accomplishment. For the first time, a working die was sunk without any design elements having to be added by hand, with the exception of the mintmark. 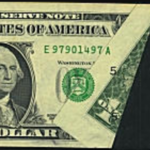 Along with the close collar technology introduced on the Capped Bust dime, the uniformity within this and subsequent issues greatly discouraged counterfeiting. The first of the 1837 Seated Liberty No-Stars dimes were approximately 30 proofs that were distributed by Director Patterson as presentation pieces. Only about 20 pieces are known to exist today. 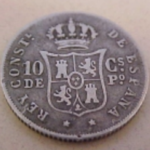 Proofs can be identified by a very apparent raised spur, a die defect, which is above the first T in STATES on the reverse of the coin. There is also a faint die scratch through ES in STATES passing to the O in OF. Proofs were struck more than once, enhancing the above defects. This die was used to mint regular issues also, but the single strike makes the spur less apparent, and the die scratch is not visible. The regular 1837 issue numbered 682,500 and contains a large and small date variety. It usually comes well struck, with only occasional weakness in the lines in the shield. Many coins were saved as first-year-of-issue souvenirs, and gem pieces are frequently seen. Because of the lack of accurate records, the New Orleans issue of 1838 has an uncertain mintage, but it is estimated that between 406,000 and 490,000 pieces were made. 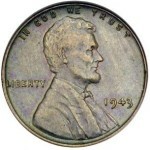 Mintmarks on this issue were punched under the word DIME. 1838-O comes softly struck, especially at the head of Liberty and in the central parts of the design. In addition, the New Orleans coins saw immediate and heavy use. Mint state pieces are rare. Collectors appreciate the Seated Liberty No Stars dime for the stunning visual appeal created by the blank fields highlighting the central design, giving the coin a “cameo” appearance. More popularly collected by design type, few collectors try to collect the entire fifty-four year Seated Liberty dime series because of the large number of coins needed and the difficulty in locating and affording the many rare dates and varieties. Type collectors seek the No Stars dime variety along with the four other major types; Stars, 1853-55 Arrows, Legend and 1873-74 Arrows. These five design types are affordable and relatively easy to find in any grade through MS 64. 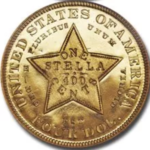 Controversy has always been part of our national life, and soon after the coin was released, a discussion followed as to why the traditional 13 stars, representing the original states, were missing. In 1838, the new Seated Liberty quarter was issued with stars encircling the figure of Liberty, and plans called for similar treatment of the half dollar and dollar. Although the No Stars motif on the dime and half dime was aesthetically very pleasing, the Mint’s penchant for uniformity of design among coins of the same metal dictated the use of the stars on the smaller coins, and they were added beginning with the Philadelphia issue of 1838.